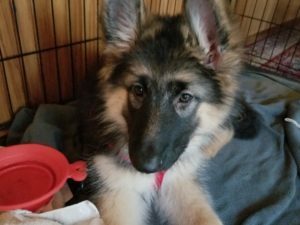 Welcome our new pack member, Zoe! Isn’t she adorable? She’s twelve weeks old and a bundle of energy. Zoe loves tug of war, chasing balls, digging and playing in the water. The water thing surprised us–none of our other German Shepherds liked water at all. Since she’s still very much a puppy, my writing has slowed a bit, sorry! But she’ll only be a puppy for a short time, so we need to enjoy it now. We got her from a Team Rubicon member. Her service dog didn’t like the puppy at all–she needed a new home quick. As a bonus, she was in Portland, OR, so I got to visit my sister (fellow author Julia Huni) and her family. We also caught up with some college friends in Portland, so it was a big win all the way around. Here’s a video of Zoe and The Amazing Sleeping Man to brighten your day! Previous Post Too much snow?